Once again I have been forced to temporarily suspend publication of The 'Skeeter Bites Report. But this time, it's not because of hackers or spam or any other type of cyber attack. 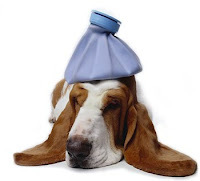 No, this time, it's because I'm as sick as a dog (And yes, that also means that I'm going to be off my radio show for awhile). Last week, I contracted something that I had never had before in my 57 years, an illness that strikes an average 2.3 million Americans every year. According to Web MD, pneumonia can be a very serious illness. Among its symptoms are a persistent cough, chest pains associated with the cough, fever, difficulty in breathing, a faster-then-normal heartbeat and loss of appetite. A mild bout of pneumonia can be treated at home and often clears up in two to three weeks. But especially for adults my age and older, for children under three years of age and for people with other diseases -- particularly asthma and diabetes -- it can lead to hospitalization or worse. My bout with pneumonia started last Tuesday night and got progressively worse over the days that followed, reaching a crisis on Saturday morning when I felt my heartbeat racing. Fearing that I was on the verge of having a heart attack -- my family has a history of them -- I checked myself in to my local hospital's emergency room. It was there that I was diagnosed. I was administered azithromycin, but that antibiotic proved to be ineffective. So after visiting my primary care physician this morning (Tuesday), was issued a new prescription for a much stronger antibiotic. Pneumonia is nothing to sneeze at. For older adults over 55 and children younger than three, it can be life-threatening. Some 28,000 Americans die from it every year. Half a century ago, my sister contracted pneumonia when she was just two years old and it nearly killed her. You never really know how terrifying it can be when you're suddenly struck by a serious and potentially life-threatening illness -- until it hits you or someone you love. If you or if a loved one is experiencing early symptoms of pneumonia, get yourself or your loved one checked out as soon as possible. Fortunately, I've got a strong immune system and should recover. But I've gotta tell you, I wouldn't wish this S.O.B. on my worst enemy. I'll check back with you later, to let you know how I'm doing.